Okay, last week we got ISO under our belts (any questions, please don't hesitate to send them to me) and this week, we're tackling aperture. I think this is my favourite because I love that bokeh effect you can get with the right aperture. Aperture is the size of the lens opening, and therefore relates to the amount of light that is permitted to enter into your camera. 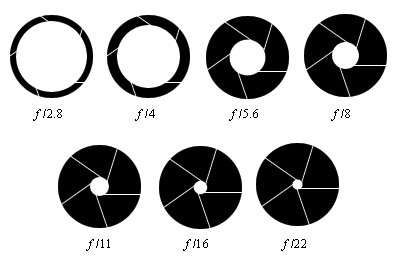 Each aperture setting is referred to as an f-stop which stands for 'focal length' or 'focus length' of the lens. The picture below shows how the aperture changes from wide open to quite small. Newer digital cameras have settings in between those listed below, but these were the originals. So if you read about bumping your aperture up one stop, these are the stops referred to. On a digital camera with the extra stops it is usually 3 clicks to get to the next 'stop'. Each step in the chart above either halves or doubles the opening (depending on which way you're going,...up or down). This means that you will be letting in half (or double) the amount of light. If your aperture is 'wide open' (which is the widest opening or lowest aperture for your particular lens), it will let in the most light possible. As you can imagine, this is particularly important if you are in a low-light setting and need as much light as possible. This light/lens phenomena is just like how your pupil gets small when you shine a flashlight at your eyes. Take the flashlight away and your pupil gets big again. Your eyes do this to control the amount of light that's getting in. Same with the camera lens. When it's really bright outside, you only need a small lens opening. When there isn't much light, your lens needs to be wider. (what do you mean you never did that flashlight thing? okay, just imagine the weird kid in kindergarten doing it then). The only really confusing part of aperture is that "large apertures (where lots of light gets through) are given,...smaller numbers". So the largest aperture on my camera lens is f/3.5 which is the smallest number. F/22 is the smallest aperture (or smallest opening), but the largest number on my camera lens. So we've covered off why aperture can be used to compensate for lighting, but the real fun of aperture is when it is used for its depth of field capabilities. Depth of field is just the amount of your photo that remains in focus. With a large aperture (small number), you get a shallow depth of field which means that the part of your photo that is closest to you is in focus, but the background is nicely blurred. This is a good choice for single-person portraits or macro photos, like a real close-up of a flower for example. With a smaller aperture (larger number), you get a longer depth of field so this is a good choice for group portraits or landscape shots. Here are basically the same two photos with different apertures. The shutter speed is also different (more next week on shutter speed) to compensate for the different light requirements of a lens wide open versus a lens with a small opening. See how the background in the first photo looks blurred, but in the second photo it is crisp from front to back? That is because of the difference in aperture. So, tweaking the aperture can help with different lighting situations and with getting your bokeh on. Next week, we'll talk about shutter speed and then we'll be able to start to have some fun with all three of them. These are all great tips! I'm really hoping Santa brings me a new camera for Christmas! I'm with Kadie- you are really good at explaining things. I knew aperture controlled the amount of light getting in, but I didn't know about depth of field. I guess it's just a matter of experimenting with your camera to find out what works and then keeping a record of it. All I need is some more patience! Terry! You totally made it finally click (I've been reading this stuff for literally 6 years and just cannot ever remember!!) when you mentioned the part about the eyes!! What a great correlation! I am loving these posts! They are so helpful! I don't have a DSLR...but my camera is able to go to manual mode, I really really really need to start playing around with the aperture and shutter speed.